Loans based on credit card sales could be the answer you’re looking for an alternative to traditional business credit. Here are two trends worth thinking about. Credit and debit card sales recently overtook cash for the first time in history and lending to small businesses is in decline. Both offer a hint at the challenges facing businesses as well as some of the alternatives they might choose to look into. One of these could be the option of taking out as their loans criteria is based on credit card sales. Fewer small businesses are applying to conventional lenders for loans. That’s partly because they have given up hope of being accepted. This is also because they now have a wider range of alternatives. Finance providers have spotted a gap in the market and are delivering a range of services to address the needs of businesses. One of these is known as business cash advance loans. These type of business loans are based on future credit card sales. This is often referred to as business loans based on credit card sales, but that’s only partly true. Yes, the amount you receive will be based on your revenue through credit and debit card sales. But it is not – strictly speaking – a loan. Instead, the provider is offering a business cash advance loan against your future card sales. Here’s how it might typically work. Let’s say you have monthly card revenues of £20,000. They might be able to offer a sum of around one month’s revenue which you would then pay back through a proportion of your future credit and debit card sales. Payments are set so the actual amount you repay depends on the level of sales. This is a good way to spread the costs and ensures that the business loan that is based on credit card sales remains affordable. If you have a successful month, for example, you will pay more and clear the total more quickly. However, if you experience a slowdown your repayments will also fall. These type of business loans can be a useful option for businesses which experience seasonal peaks and troughs. For example, many pubs and restaurants have become all too familiar with the January slump when people attempt to get themselves back into shape after the Christmas excesses. A business cash advance loan could provide an injection of capital to see you through this barren time until business picks up once again. It can also address a short-term cash crisis. For example, if you’re struggling to make payroll or have some substantial and unavoidable bills to pay, this could see you through a rocky patch. That could prove to be crucial as many small and medium sized businesses fail despite having relatively robust sales data. How can credit card sales get a business loan? Business credit card loan lenders will require an applicant to provide the last 6 months of merchant card processing statements. This will demonstrate amount of credit cards sales they process each day. Merchant cash advance lenders will then use these projections to assess the amount of credit card sales the merchant will do in future months. The lender will then offer to buy a portion of those future credit card sales transactions at a discounted rate. If the merchant agrees to the business funding, the lender will then agree a lump sum amount in to your business bank account. The repayments will take place by splitting each day’s credit and debit card sales until the cash advance is repaid in full. Repayment happen by withholding a percentage of each day’s sales usually about 7% of each transaction. A merchant loan advance could also be a useful way to fund investment in the future by using your credit card sales for a business loan. We are living through an age of digital transformation in which technology is creating new opportunities for businesses of all sizes. This has the potential to dramatically improve your marketing, expand your reach and grow revenues. More efficient IT infrastructure could also streamline operations and reduce your administration costs allowing you to pass those savings on to your customers. Unfortunately, many businesses will not be unable to take advantage of this as they will not feel they are in a position to manage the upfront investment required. That could potentially put the health of their business at risk. If they do not make the investments, their competitors will. They’ll be in a position to increase their revenue and offer their products on a more cost-effective basis. This is, then, a good way to overcome obstacles and unlock opportunities in a way which you can afford. Because this is an advance based on credit card sales rather than traditional business type loans, you won’t be held back by problems with your credit rating. It also requires less administration and the money can be in your account much more quickly. 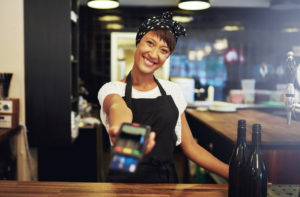 These small business loans that are based on credit card sales are perfect for any business that has been trading for six months or more. The small business loan can help with growth as well as using as a cash flow tool within the business. Some business may be restricted in gaining these type of business loans. The merchant may simply not have enough credit card sales each month. Idealy the flow of card sales needs to be £5,000 or more per month. As with anything, you should shop around to get the best deals. Look at the fees and the terms and conditions to make sure you fully understand the full costs of the deal. This is not the only option. It’s a great one for any business which takes a substantial proportion of its revenue through credit or debit cards. Businesses can gain an unsecured card machine loan within 48 hours. Funding is available up-to £200,000. These types of loans are a perfect fit for merchants that have card payment terminals. To find out more simply complete the online enquiry form. Merchant Cash Advance, Can we use them for working capital? What are the Best Business Cash Advances available to my Company. Are Credit Checks Required For A Business Cash Advance?